You know better than anyone the tight margins for crop production across your acres this year. In fact, the USDA Economic Research Service reported that in 2017 the total economic costs to grow corn in South Dakota averaged $670 an acre and soybean production costs were $474 an acre. * According to Farm Business Management, in recent years the numbers were even higher in Illinois, where the total costs to grow corn exceeded $800 an acre and soybean costs were over $600 an acre. ** Staying ahead of these challenges you face every day is critical to your success. The numbers are eye-opening, and as someone who has been involved in agriculture my whole life, I know nothing comes easy in the fields – during the growing season, the work day is often measured in acres, not hours. That’s why as we head into a busy planting season, it’s important to make the most of your seeding and input opportunities. Equally important is making sure you gather quality planting data in your Climate FieldView™ account. Accurately collecting your as-planted, as-applied and harvest data will support the decisions you make each season. Make sure your planting equipment is connected. 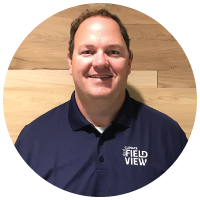 If you haven’t read Cory Spaetti’s recent blog post on connecting your equipment, it’s worth checking out to better understand how to visualize your data within your FieldView account. For seamless and accurate data collection, make sure your FieldView™ Cab app is up to date, you have set up your equipment in the app, and that your FieldView™ Drive or Precision Planting 20/20 SeedSense® software is properly installed. Create the right field boundaries. Now is also a good time to be sure you have adjusted any field boundaries in your operation to effectively measure product performance in specific areas of your operation. You can manage your field list and boundaries for your entire operation by logging into your Climate FieldView™ account at climate.com. Optimize your seed investment with variable rate scripting tools. Our manual scripting solution allows you to use multiple map layers to easily create customized seed and fertility prescriptions and then share with your agronomist, Climate Business Manager, dealer, or business partner for a second opinion. Learn more about the latest planting topics with these helpful FieldView webinars. For quick reference, be sure to read our pre-planting checklist. If you have additional questions, feel free to contact your Climate dealer, or the Climate Support Team at (888) 924-7475 or climate.com. I wish you a safe and successful planting season! Luke Samuel is the Commercial Product Director for The Climate Corporation and leads the Climate Field Product Specialist teams focused on product testing and training. Luke has been with Monsanto for 10 years, most recently as the Regional Agronomy Lead for the Minnesota and Wisconsin Region.